"Sniff. Sniff. Sniff. Sniff. I need a whiff," Finlay, the Angus bull, chanted as he walked along, sniffing the ground. 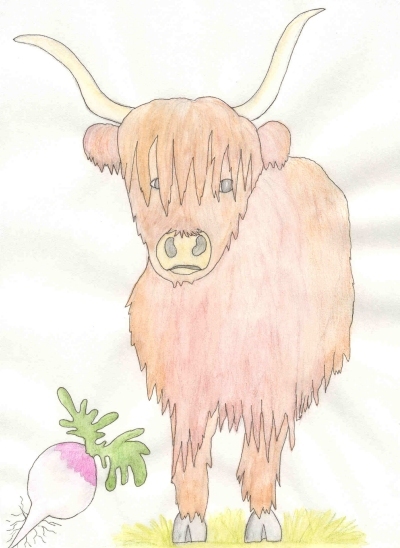 Finlay loved to eat turnips, but they grew under the ground, so he had to sniff them out. All day long he walked around sniffing the ground and chanting. Some of the other animals nearby thought Finlay looked awfully silly. Ian, the ram, started laughing when Finlay walked by him. Finlay didn’t even see Ian. He was too busy sniffing. Ian laughed even harder when he heard him chant, "Sniff. Sniff. Sniff. Sniff. I need a whiff." He dropped his woolly body to the ground and rolled around laughing hard. Athol, the pheasant, saw Finlay coming. He’d been flying around the heather-covered hills and had seen Finlay from a long distance away. "What is that silly bull doing?" he said out loud to himself as he pecked a few roly-poly bugs from under a dead tree stump that he was standing next to. "It looks like he’s sniffing the ground." Athol started laughing. The closer Finlay got, the harder Athol laughed. "Silly bull," he giggled. When Athol heard Finlay chanting and sniffing, he laughed even harder. His feathers bobbed up and down as he heard, "Sniff. Sniff. Sniff. Sniff. I need a whiff." Finlay didn’t even notice Athol, as he was too busy sniffing for turnips. Grear, the fox cub was playing with her brother, Davis. They were wrestling about in the bushes when they heard Finlay chanting. "Sniff. Sniff. Sniff. Sniff. I need a whiff." They stopped and sat up, their little cub ears standing straight up in the air. "What is Finlay doing?" Grear asked. "It looks like he’s sniffing the ground," Davis replied. "But what’s he singing?" the curious cub wondered. They ran up closer to Finlay and followed him from a safe distance. "He is sniffing the ground. Why do you think he’s doing that?" Grear asked. "I don’t know," Davis answered, then pounced on his sister, tugging at the nape of her neck. Losing interest in Finlay, the two continued their wrestling and fighting games. Finlay hadn’t even noticed the two fox cubs. He’d been too busy sniffing for turnips. As he walked past Chalmers, the cat, he began to sniff the faintest aroma of turnips. "Sniff. Sniff. Sniff. Sniff. I need a whiff," he mumbled. Chalmers stopped preening her fur and watched Finlay. He started chuckling. It wasn’t every day that you saw a huge black bull walking by sniffing the ground. The more he watched, the more he laughed. He laughed so hard that his whiskers stood straight up in the air and so did his tail. Finlay didn’t even notice Chalmers. He was too busy sniffing for the turnips. He began to get excited. He knew there were turnips nearby. He could smell them. He began to run. His long legs thudded the ground as he ran. His huge ears bounced up and down against his head. Suddenly he stopped. He sniffed the ground over and over again. "Turnips!" he cried out. He used his hooves to dig the ground up. He tugged the green plant on top and pulled it with his mouth. Soon the roots came free. Attached to them were several turnips. "Yes! Turnips!" he cried with delight. Finlay dug all the turnips out and gobbled them down. They were delicious. He was happy. It didn’t matter that Ian, Athol, Grear and Davis, or Chalmers had laughed at him. It didn’t matter because he had his turnips and they were delicious.